A few months ago I had an unexpected email from one of the editors at Applewood Books in Carlisle, Massachusetts, informing me that they were reprinting the Christmas book I wrote in 2006. Needless to say, I am delighted that the fifty or so stories about New England Christmas traditions will now reach a new generation of readers, but I wondered if the stories, after all these years, would still hold up. I immediately grabbed my dog-eared copy of the book and began flipping through the pages. Surprisingly, the stories had staying power, which is the whole point of traditions, isn’t it, that we can rely on them, or should be able to rely on them, to not change too much down the generations. Traditions are like families: with each generation there are permutations, something new added to tweak the mix, but the family resemblance is still there. 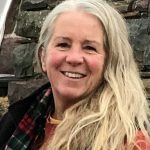 Genealogists talk often about traditions – and heirlooms – as the glue that binds the generations together despite our ever-evolving world. We take a certain comfort, all these years later, in knowing that our ancestors didn’t do things much differently than we do and even more comfort in the connection we experience and the intimacy we feel if we are lucky enough to own something tangible that belonged to them. A couple of the stories in the book, I knew, needed their own tweaking. The story that I titled One Enchanted Evening is about that magical world, the Enchanted Village, a tradition that so many of us remember from childhood. For years, beginning in 1959, it had been a steady holiday presence at the old Jordan Marsh department store in downtown Boston, but after an economic recession in the 1970s and a later corporate restructuring, the Village became something of a vagabond, searching for a permanent home. It finally found one in 2009 when Jordan’s Furniture in Avon, Massachusetts bought the display, much to the delight of a new generation of children, as well as their parents and grandparents. Another story that I knew needed an update was one I had originally titled Sleigh Bells Ring at Bevin Brothers Bells. I drove along Bevin Road until I arrived at a sprawling redbrick factory – a vestige of a bygone time – that probably looked pretty much as it had when it was built in 1832. With the fondest of memories, I recall, as though it was yesterday, my 2005 visit to the Bevin bell factory in East Hampton, Connecticut. I drove along Bevin Road until I arrived at a sprawling redbrick factory – a vestige of a bygone time – that probably looked pretty much as it had when it was built in 1832. I knew immediately – I could hear it – that I was in the right place. I sat down with Stan Bevin, who shared the company’s long history while proudly declaring himself the fifth Bevin generation to make bells, pointing to framed photographs of his bell-making Bevin ancestors. Then he gave me the grand tour of the factory. All these years later, revisiting my notes and refreshing my memory, I realized something that I had not properly recognized back in 2005, years before I had immersed myself in genealogy: that companies, too, can have their own ancestral tree. The Bevin Brothers Manufacturing Company took root about 1808, when William Barton began making bells in East Hampton, a town founded in 1739 by settlers from Eastham, Massachusetts. Among Barton’s apprentices was William Bevin, born in 1804 to Isaac Bevin (1773–1870) and Anna Avery (1780–1851). Even then, the Bevin family had generations-deep roots in Connecticut, dating to Arthur (c. 1653–1697), who was granted land in Glastonbury in 1696, and later generations who settled East Hampton. Arthur’s grandson William (1714–1797) and great-grandson Isaac (1746–1791) were both soldiers during the Revolutionary War. By 1832, William Bevin (1804–1858) had opened his own bell factory, one of nearly thirty in East Hampton – “Bell Town”; he was later joined in business by three brothers: Chauncey (1806–1884), Abner Griswold (1810–1896), and Philo (1813–1893). 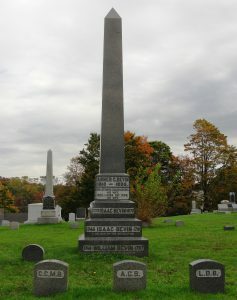 All four of the brothers, along with earlier and later generations of the Bevin family, are buried in East Hampton’s historic Lakeview Cemetery. The company passed to Abner Griswold’s son, Chauncey Griswold (1851–1948), then to his son Stanley Avery (1885–1956), and to his son, Chauncey Griswold II (1911–1979). It was Chauncey’s son, Stan, who had graciously given me the tour. In 2011, Stan turned the reins over to his nephew, Matthew Griswold Bevin, the son of his brother Avery. Just months later, during Memorial Day weekend in 2012, the 180-year-old factory was struck by lightning and burned to the ground, a total loss but for an exterior wall. All who heard the news and saw the ruins lamented what surely seemed to be the passing of a deeply-rooted family history and an iconic company that had prided itself on being America’s sole surviving bell-maker, with a proud place in East Hampton’s town and manufacturing history. Though felled, could something from this ancestral tree be salvaged? Could a new offspring be propagated? Mindful of the hardships and challenges that their Bevin ancestors had overcome in the previous 180 years and determined to keep alive its core identity – and that of East Hampton, whose town seal and street signs depict a bell – the Bevin family wasted no time in replanting near the original site. If the voices of their ancestors no longer whisper from the rooms of the lost factory, if their footsteps are no longer heard shuffling across the ancient floorboards, the bells, in all their many varieties, connect the new building and the new generation to their ancestors, to a time in New England when sleigh bells jingled joyfully in winter wonderlands, when church bells called worshippers to service and fire bells rallied the bucket brigade. And every time an angel gets its wings, we can thank the Bevin Brothers’ bell company. Family history – and company history – sets the context for the present and the future. What is past is prologue. 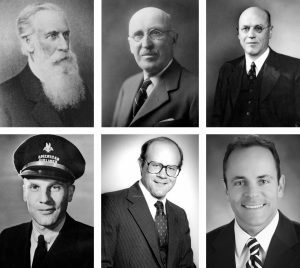 The Bevin Brothers company genealogy is a wonderful gift for the day. Thank you. I also appreciated “Traditions are like families: with each generation there are permutations, something new added to tweak the mix, but the family resemblance is still there.” One of my daughter’s is serving Christmas dinner with family recipes supplemented with her own. What a charming and inspiring story! 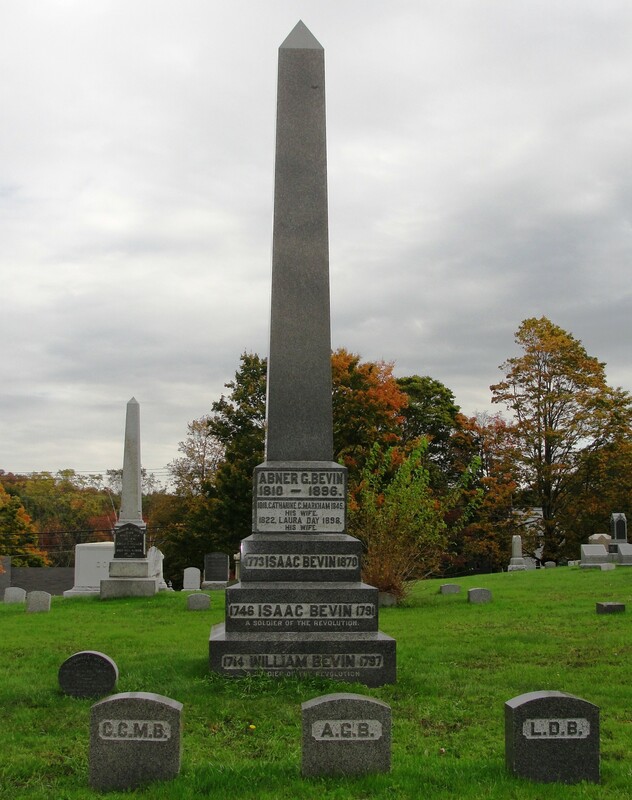 Arthur Bevin is my 7th great grandfather, his daughter Abigail my 6th great grandmother–I haven’t done any research on this line thus far but was aware of the Bevin Brothers Company and the bells since I now live in Connecticut. Nice to know I have a distant family connection! I am curious what the exact title of this Christmas book is and who is selling it? I hope you will let us know.